The foot is where movement begins, requiring mobility to perform simple functional movements. The knee however, requires stability with daily movements, but more importantly, dynamic sport movements such as soccer or football. In this article, we will review the anatomy of the knee, common injuries of the knee, functional assessments and training strategies to work with clients with previous injuries. Let’s look at the anatomy of the knee.. The joint is vulnerable when it comes to injury, because of the mechanical demands placed upon it and the reliance for soft tissue to support the knee. 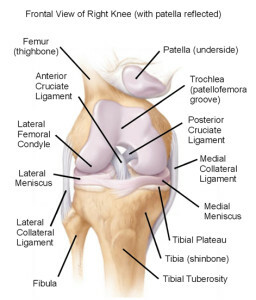 There are two primary joints within the knee, the tibiofemoral joint and the patellofemoral joint. a. Tibiofemoral joint: Is a hinge joint that permits some rotation between the distal end of the femur and proximal end of tibia. The joint capsule surrounds the femoral condyles and tibial plateaus and provides stability to the knee by the medial collateral ligament(MCL) and the lateral collateral ligament (LCL). 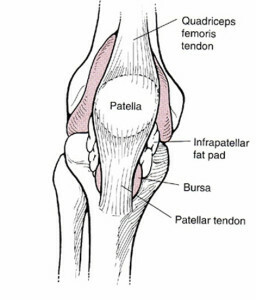 b. Patellofemoral joint: Is formed by the patella(knee bone) that glides in the trochlear groove of the femur. The height of the lateral femoral condyle helps prevent lateral subluxation, while soft tissue surrounds the joint to increase stability. This is seen in figure 3. Several ligaments described below provide stability at the knee joint. a. Collateral ligaments: The two primary supporting ligaments are the medial collateral ligament (MCL), which is along the inside of the knee. The MCL is a thinner and weaker ligament biomechanically, making it more susceptible to injury more often injured per the research. While the lateral collateral ligament(LCL) is along the outside or lateral aspect of the knee providing lateral knee stability. b. Anterior cruciate ligament(ACL): is the most commonly injured knee ligament and is taut during knee extension. It originates more proximally on the femoral side than the posterolateral (PL) bundle. It inserts anteromedially(front and to inner side) on the tibia. The ACL limits and controls forward translation of tibia on the femur and limits tibial rotation. c. Menisci: the menisci are fibro cartilaginous discs located on the articular surface of the tibia along the medial and lateral tibial plateaus. The outer portion of the meniscus(lateral meniscus)is oval shaped (O) and thick. Attaching at the anterior and posterior horns via coronary ligaments. Vascularity: The middle third and inner third of both menisci are relative avascular. The medial meniscus is more C-shaped, and thinner in structure. Both menisci receive nutrition through synovial diffusion and from blood supply to the horns of the menisci. Function of the menisci: The menisci provide shock absorption, joint lubrication and stabilization. There are several common injuries that affect the knee. 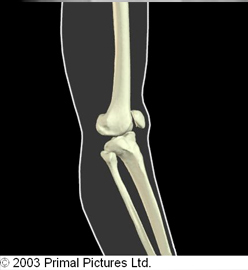 The most common are patella femoral syndrome(PFS), osteoarthritis(O.A.) and anterior cruciate ligament(ACL) injuries. In this next section, we will review each condition providing a deeper understanding of each. Pathophysiology/sign and symptoms: PFS is a condition where the patella does not translate biomechanically in the trochlear groove between the femoral condyles. Here the patella is positioned in either a tilt, glide or rotation accompanied by diffuse, achiness in the front of the knee. Contributing Factors(Evidence Based Research): Several studies have shown that decreased flexibility of quadriceps and hip flexors(Lankhorst et al. 2012 & Meira et al. 2011) contribute to PFS. Decreased hip abductor strength has been shown a significant factor seen in multiple studies as contributing to PFS (Khayambashi, H., et al. 2012, Meira et al, (2011), Bolgla et al. (2008),Cichanowski et al. (2007), and Robinson et al. (2007). Other factors include prolonged wearing of high heels, muscle imbalances(quadriceps>hamstrings). 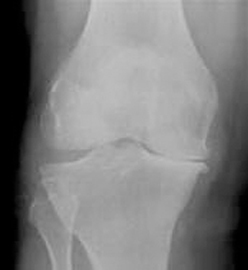 Pathophysiology/sign and symptoms: A degenerative process of varied etiology, which includes mechanical changes within the joint as seen in figure 4. Risk Factors: Excessive weight born on hip joint, muscle imbalance, repetitive stressors. Sign and symptoms: Pain in the a.m. described as “achy” that decreases as the day progresses, pain with weight bearing or walking, difficulty squatting, and lateral thigh discomfort. In the last several years, there has been more news about the incidence of ACL injuries. The incidence rate is greatest between the ages of 16 and 18 years. Female athletes are 3-9x more likely to sustain an ACL injury then male athletes. This results in at least 200,000 ACL reconstructions are performed each year in the United States, with estimated direct costs of $3 billion (in U.S. dollars) annually (Frobell, R., et al 2010). Pathophysiology/Mechanism of Injury: The knee is struck while in hyperextension, forcing tibia anterior(forward)on the femur, as seen in figure 5. The ACL can also be injured with same mechanism of injury with combined with medial rotation of the lower extremity(LE). This creates instability and a direct disconnect the nervous system to the musculoskeletal system because of the “lack of control” within the knee joint. 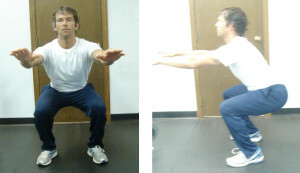 One great test to assess a client’s movement pattern, is the squat. 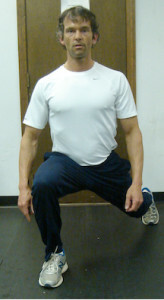 The squat is a classic fundamental primal movement that someone typically performs almost on a daily basis. With this test, you can observe how the client’s ankle, knee, hip and back moves compared to normal movement patterns. This is seen in the figure below. 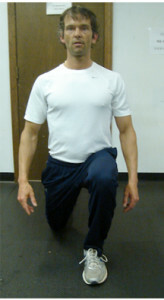 Another simple assessment is an in place lunge, which examines one’s control through the entire kinematic chain. 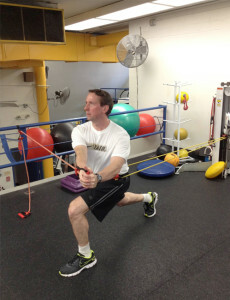 The lunge is another fundamental primal movement. The lunge is a dynamic movement that is typically performed during daily activities (stooping down to pick something up) or as part of an athletic movement. This test examines ankle control, knee control and pelvic movement in the sagittal plane. Lastly, a diagonal traveling forward lunge looks at the ability of the client to control ankle, knee, hip, and pelvic movement in both the sagittal and frontal planes. This is not only a functional movement, but very effective for sport specific clients. With any injury, the most important thing to remember is the type of injury, healing time and prior level of function of the client. Recommendations for training: Continued stretching of tight hip flexors, ITB, and hamstrings is fundamental. Client should be taught initially static core strengthening exercises, and then progressed to dynamic core strengthening as appropriate. Client would also benefit from education on shoes with respect to type that are most effective for them, and to cross train utilizing, such as hiking, yoga, pilates, and swimming. Lastly, to alter running surfaces(if client runs) and educating the client about changing their shoes every 500 miles or 6 months for maximum stability and control. Recommendations for training: Aqua therapy has been shown in the research to significantly reduce pain, improved physical function, strength, and quality of life (Hinman, Rana S., et al 2007), stretching ITB, hip flexors, quadriceps and hamstrings, strengthening weaker hip abductors(glute medias/minimus). Strengthening specifically hip abductors in various studies when compared to general strengthening resulted in s significant reduction in knee pain, objective change in functional outcome tests, physical function and daily activities (Bennell,K.L., et al. 2010 & Hernández-Molina, G et al. 2008). 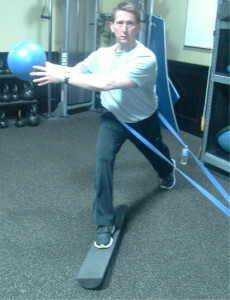 Core strengthening shoulder also is an integral part of the training program. Recommendations for training: should focus on hamstring strengthening. Strengthening the hamstrings biomechancally transfers the load from the front of the knee to the back, thereby decreasing the stress to the ACL. Neuromuscular training as seen in figure 9, is very effective. It challenges the connection between the nervous and musculoskeletal system requiring the client to stabilize the entire kinematic chain. Research has shown neuromuscular training reduces ACL injuries (HUBSCHER, M. 2010 & Griffin LY, et al., 2006). Core strengthening should be multidirectional in nature as seen in figure 10. In the picture on the left, left trunk rotation involves the internal/external obliques, atissimus withdorsi, and right glute medius and minimus muscles to stabilize, as the left glute medius and minimus to stabilize. With the yellow cord applied from the back, this engages the abs primarily to stabilize (from the front) accompanied by the obliques to stabilize, which the low back extensor muscles contract to prevent being pulled backwards. It is important to include dynamic training focusing on hamstrings, glute medius, maximus. Closed chain strengthening (CKC) exercises, such as diagonal forward and diagonal reverse lunges are not only functional, but replicate many common sports as soccer, football and basketball accordingly. Contrainidications/Precautions: Avoid leg extension exercises completely this causes an anterior translation(shearing) of the tibia on the femur/stressing the graft. Therefore, the exercise is contraindicated. *Biomechanically, shearing stress on the ACL is greatest from 30 degrees of knee flexion to full extension. • Surgical reconstruction typically sidelines athlete for 6-9 months and once cleared by physician can return to sport activities. and weak links of the knee, common injuries and evidenced based training strategies, should provide you with the insight to better understand and work with clients with these kind of injuries more confidently. Written by Chris Gellert, PT, MMusc & Sportsphysio, MPT, CSCS, AMS. Chris is the CEO of Pinnacle Training & Consulting Systems (PTCS). A continuing education company, that provides educational material in the forms of home study courses, live seminars, DVDs, webinars, articles and min books teaching in-depth, the foundation science, functional assessments and practical application behind Human Movement, that is evidenced based. Chris is both a dynamic physical therapist with 14 years experience, and a personal trainer with 17 years experience, with advanced training, has created over 10 courses, is an experienced international fitness presenter, writes for various websites and international publications, consults and teaches seminars on human movement. For more information, please visit www.pinnacle-tcs.com. Bennell, K.L., et al., 2010, ‘Hip strengthening reduces symptoms but not knee load in people with medial knee osteoarthritis and varus malalignment: a randomized controlled trial,’ Journal of Osteoarthritis and Cartilage, vol. 18, issue 5, pp. 621-628. Bolgla, L, et al., 2008, ‘Hip Strength and hip and knee kinematics during stair descent in females with and without patellofemoral pain syndrome,’ JOSPT, vol. 38, pp. 12-18. Cicanowski, H et al., 2007, ‘Hip strength in collegiate female athletes with patellofemoral pain,’ Medicine Science Sports Exercise, vol. 39, pp. 1227-1232. Frobell, R., et al 2010, ‘A Randomized Trial of Treatment for Acute Anterior Cruciate Ligament Tears,’ New England Journal of Medicine, vol. 363, issue 4, pp. 331-341. Griffin LY, et al., 2006, ‘Understanding and preventing noncontact anterior cruciate ligament injuries: a review of the Hunt Valley II Meeting, January 2005, American Journal Sports Medicine, vol. 234, pp. 1512-1532. Hernández-Molina, G., et al., 2008, ‘Effect of therapeutic exercise for hip osteoarthritis pain: Results of a meta-analysis,’ Journal of Arthritis Care & Research, vol. 59, issue 9, pp. 1221–1228. Hinman, Rana S., et al 2007, ‘ Aquatic Physical Therapy for Hip and Knee Osteoarthritis: Results of a Single-Blind Randomized Controlled Trial,’ Journal of Physical Therapy, vol. 87, no. 1, pp. 32-43. HU ̈ BSCHER, M., et al., 2010, ‘Neuromuscular Training for Sports Injury Prevention: A Systematic Review,’ American College of Sports Medicine, pp. 413-421. Khayambashi, H., et al., 2012, ‘The Effects of Isolated Hip Abductor and External Rotator Muscle Strengthening on Pain, Health Status, and Hip Strength in Females With Patellofemoral Pain: A Randomized Controlled Trial, ‘Journal of Orthopedic Physical Therapy, vol. 42, no. 1, pp. 22-29. Landry SC, et al., 2007, ‘Neuromuscular and lower limb biomechanical differences exist between male and female elite adolescent soccer players during an unanticipated side-cut maneuver,’ American Journal of Sports Medicine, vol. 3, pp. 1888–1900. Lankhorst, N, et al, 2012, ‘Risk Factors for Patellofemoral Syndrome: A Systematic Review,’ JOSPT, vol. 42, No. 2, pp. 81-90. Meira, E., et al., 2011, ‘Influence of the Hip on Patients With Patellofemoral Pain Syndrome,’ Sports Health, vol. 3, issue 5, pp. 455–465. Prins, 2009,’ Females with patellofemoral pain syndrome have weak hip muscles: a systematic review, Australian Journal of Physiotherapy, vol. 55, issue 1, pp. 9-15. Some of my clients seem jealous of their teammates. “They eat twice as much as I do and they are skinny as a rail. I just smell cookies and I gain weight,” spouted one collegiate runner. She seemed miffed that she couldn’t eat as much as her peers—and she couldn’t understand why. They all ran the same mileage, did the same workouts, and were similar in body size. Life seemed so unfair! Yes, life is unfair when it comes to weight management. Some people gain (or lose) body fat more easily than others. Unfortunately, fat gain (or loss) is not as mathematical as we would like it to be. That is, if you persistently overeat (or undereat) by 100 calories a day, in theory you will gain (or lose) 10 pounds of body fat a year. But this theory does not hold up in reality. People vary greatly in their susceptibility to gain or lose body fat in response to over- or under-eating. In general, research has suggested when people overeat, about 85% of the excess calories get stored as fat and the rest gets lost as heat. Overfed fat cells grow in size and in number and provide a storehouse of energy. Obese people commonly have enough fat stores to last a year or more; even lean athletes have enough fat stores to fuel a month or more. Fat can be advantageous during a time of severe illness or a famine. Thermic effect of food: This refers to the energy needed to digest, absorb and either convert food into fuel for the muscles and organs or store the excess energy as body fat. The thermic effect of food increases ~14% with overfeeding, due to the added energy needed to process the excess food. Purposeful exercise: This is what you burn during your workouts. This can vary considerably from day to day. Non-exercise activity thermogenesis (NEAT): This refers to activities of daily living (brushing teeth, washing dishes, etc. ), fidgeting, energy used to maintain posture when standing and sitting, and spontaneous muscle contractions that occur during the day apart from your purposeful exercise. People with high NEAT spontaneously putter around the house, fidget with pencils, use their hands when talking, and are animated and lively. NEAT is genetic and somewhat predictive of who stays lean throughout their lifespan. People with low NEAT are good at sitting quietly. For example, obese people tend to sit 2.5 hours more a day than their peers and this can save them about 350 calories a day. Are they obese because they sit more? (Or do they sit more because they are obese?) Is NEAT the problem? To better understand why some people lose or gain weight more easily than others, Dr. James Levine PhD of the Mayo Clinic designed a study to look at the biological mechanisms that hinder fat-gain. Dr. Levine studied 16 non-obese subjects (12 males and 4 females), ranging in age from 25 to 36 years. They volunteered to eat 1,000 excess calories a day (above what they needed to maintain weight) for 8 weeks. 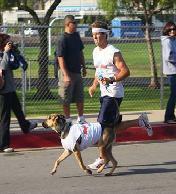 The subjects were healthy, did not do purposeful exercise more than twice a week, and maintained a stable weight. Prior to being overfed, the researchers monitored the subjects for two weeks to learn how much food they regularly consumed to maintain their weight. 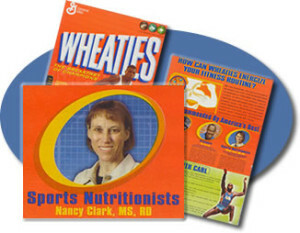 During the study, the subjects lived at their homes but ate supervised meals at the research center. The food had been carefully prepared and measured in a metabolic kitchen. 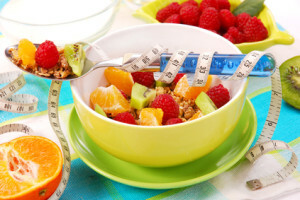 The weight-gain diet was high in protein (20% of total calories) and fat (40% of calories), and low in carbohydrate (40%). The researchers accounted for almost all of the excess 1,000-calories a day. On average, ~430 of the 1,000 calories were stored and ~530 were dissipated via increased energy expenditure. The researches even measured 3 days of poop before and at the end of the study to be sure the subjects did not excrete calories during overfeeding. Only 38 calories a day got flushed down the toilet during overfeeding — 13 calories more than during normal eating. Additional calories burned via NEAT ranged from none to 690. 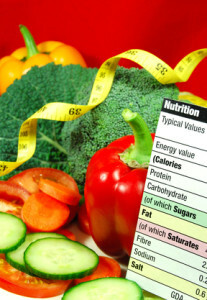 The researchers used highly accurate methods to measure changes in body fat (DXA). Some of the subjects gained 10 times more fat than others, ranging from 0.8 to 9 lbs (0.36 – 4.23 kg). The overall weight gain ranged from 3 to 12 lbs (1.4 -5.5 kg), some of which was additional muscle. NEAT explained the big variation in weight gain that occurred with the subjects in this overfeeding study. The subjects who were good fidgeters and putterers gained less. The average increase in NEAT was 336 calories a day, but this actually ranged from burning 98 calories less than baseline to burning 690 calories more than baseline. The subject who burned the most calories strolled around the research facility (or did equivalent movement) about 15 minutes more per hour than the other subjects. Despite popular belief, the ease of gaining weight is unlikely due to having a “slow metabolism.” Most often, athletes who are easy gainers are mellow, sit calmly, and don’t fidget. This contrasts to teammates that are bouncing around the locker room. If you are the mellow-type, blame your genetics — not a slow metabolism — for your ease of weight gain. And perhaps you can be grateful you can spend less money on food because you don’t eat as much? Levine J, N Eberhardt, M Jensen. Role of Nonexercise Activity Thermogenesis in Resistance to Fat Gain in Humans. Science 283:212-214, 1999. Levine J, Vander Weg M, Hill J, Klesges R. Non-exercise activity thermogenesis: the crouching tiger hidden dragon of societal weight gain. Arterioscler Thromb 26(4):729-36, 2006. Did you know in 1980, according to the Center for Disease Control (CDC), 5.6 million Americans had been diagnosed with diabetes? This had more than doubled by 2000, with 12 million reported cases of diabetes. If this trend were to continue, by 2020 there would be an estimated 24 million diabetics in the United States alone. However, in 2012 the American Diabetes Association (ADA) estimated that 9.3% of the population, or 29.1 million Americans, have diabetes. Ann Marie Turo, occupational therapist, yoga and Pilates instructor and Reiki master, owns a thriving Pilates-based studio. When Turo was diagnosed with a breast cancer reoccurrence in 2002, she was devastated. 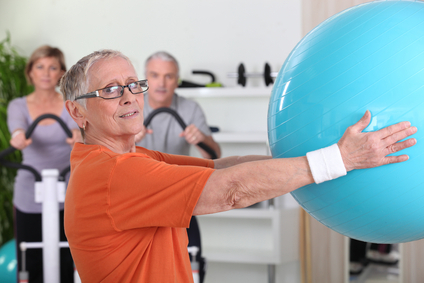 Despite having limited range of motion, strength and endurance, as well as decreased ADL function, it was not recommended that she have any rehabilitation. This situation is not unusual. After undergoing a self-described “meltdown,” she decided to take matters into her own hands. Turo designed her own rehabilitation program, which included visualization, Pilates, yoga and Reiki, along with traditional occupational therapy modalities. Turo believes that an “integrated” approach is the best way to heal physically and psychologically from breast cancer. That is why she created Integrated Mind and Body in Boston. Pilates is enjoying wide popularity throughout the United States as a form of exercise. It focuses on the whole person, uniting mind and body through a series of flowing movements that require both flexibility and strength. Recently, therapists have began incorporating Pilates as part of their general rehabilitation program for athletes, back injuries, hip/knee replacements and even autism. Breast cancer survivors are starting to benefit from Pilates as well. A recent pilot study (Keays, 2007) found a modest effect in improving shoulder abduction and external rotation. However, further research is necessary to determine both the safety and efficacy of Pilates, as well as optimal exercise guidelines. There are eight principles of Pilates: relaxation, concentration, control, centering, fluidity, precision, stamina and breathing. Joseph Pilates, who developed this movement method, believed that one must pay attention to each exercise and perform it with the utmost control to avoid injury. He believed that it is not the quantity that counts, but the quality of each repetition. Pilates exercises initiate from the “powerhouse,” or core musculature. Therefore, every exercise is an abdominal exercise that initiates at the center and flows outward. This is in tune with developmental principles and ensures a proper base from which to perform more distal work. Proper breathing is another cornerstone of this technique. Deep breathing is essential to activate the transverse abdominal muscles, which is why the exercises are coordinated with both inhalation and exhalation. Inhalation facilitates spinal extension and trunk stability while exhalation facilitates spinal flexion and scapular depression. During upper extremity work there should be a sense of gliding the scapulae down the back to promote shoulder stability. Pilates can incorporate more than 500 exercises, which can be performed either on a mat or on special equipment, such as the Cadillac, Reformer and barrels. These exercises can be modified to meet the needs of patients through the use of springs to assist and mobilize the muscles, and provide resistance when patients are stronger. Women who are diagnosed with breast cancer will have surgery, which can be followed by systemic treatment such as chemotherapy and/or hormone therapy and then, possibly, radiation. After undergoing breast cancer surgery and treatment, the body seems lost and out of control. Breast cancer survivors are faced with many issues including fatigue, loss of range of motion and strength in the affected arm, lymphedema risk, weight gain and poor posture. Furthermore, there are psychological implications to being diagnosed with a life-threatening disease and breast removal. Pilates is one tool that can help one regain a sense of mastery and control over a body that seems foreign and lost. How Does the Rehab Work? Loss of range of motion and tightness in the axillary and pectoralis regions is common after breast cancer surgery, especially after axillary lymph node dissection and mastectomies. The more extensive the surgery, the greater the limitations secondary to greater tissue loss, pain and scar formation. Because many of the Pilates exercises are performed in the supine position, the neck and back can be comfortably supported. Active assisted exercises with a towel or band are used to improve mobility of the shoulder girdle while the spine is in a neutral position. Pilates focuses on the scapula stabilizers including the rhomboids, latissmus dorsi, middle/lower trapezius and serratus anterior while performing active range of motion, which is different than a traditional rehabilitative approach. The use of imagery is often used to coordinate the mind and body, so one may be told to “place those wing bones in your back pocket.” Even some of the exercises can be done in side lying, which eliminates gravity, making the shoulder exercises easier to perform. Pilates emphasizes proper alignment and posture which improves movement efficiency, opens up all the lymphatic channels and facilitates good breathing. The risk of lymphedema, the buildup of protein-rich fluid in the chest, trunk and arms, is another concern for anyone who has received lymph node dissection and/or radiation. This is due to scarring of the lymphatic vessels that disrupts lymphatic flow, along with the loss of mobility. This can interfere with normal lymphatic or venous drainage from the arm. Since diaphragmatic breathing is used in Pilates both to stabilize and mobilize the spine, this enhances trunk organization. Lymphatic fluid can be propelled through the body with this type of breathing, along with proximal to distal exercise. As one inhales and exhales, the pressure changes, stimulating lymphatic return. In addition, diaphragmatic breathing lowers heart rate and blood pressure, creating a relaxation response conducive to emotional healing. Use of the deep stabilizer muscles, including the transverse rectus abdominas and multifidus, encourages pumping to the thoracic duct, the main area for lymphatic return. This in effect clears the trunk for fluid from the axillary region and pectoralis area where lymph flow may be impaired. Once the trunk is cleared, one can exercise the arm at risk. Compression garments or bandages should be worn while exercising if at risk. Exercises should be progressed slowly and gradually to allow the lymphatic system to adjust to an increased lymphatic load. There are usually few repetitions for each Pilates exercise, which is a natural fit for women at lymphedema risk. Fatigue both during and after cancer treatment is the most common side effect of the treatment. Many women feel unable to function and perform daily activities while undergoing chemotherapy or radiation treatments, and this fatigue can become overwhelming as treatments accumulate. However, many research studies have confirmed the advantages of both strength and aerobic conditioning even during treatment. Pilates offers a gentle introduction or re-introduction to regular exercise that can slowly help restore strength and endurance. One can gradually build up by performing the exercises at least twice a week. This should be combined with an aerobic conditioning program, such as walking, when able. It is time to think about alternative approaches to meeting the needs of this population, along with individuals suffering from other chronic conditions. As one can readily see, Pilates offers many benefits to women recovering from cancer, especially since occupational therapists are well trained in the modification of such activities and exercises. At Integrated Mind and Body, Turo works with breast cancer survivors as well as individuals who have had depression, total knee replacements and total hip replacements. She requires a signed physician’s release form, and does a full intake on clients that includes medical history, pain, postural analysis and ADL evaluation, as well as the standard occupational therapy assessments. Clients pay out of pocket to receive Pilates and Reiki in conjunction with traditional therapy services. Turo demonstrates that therapists can balance an occupational therapy frame of reference along with other healing modalities to be successful. Reprinted with permission from Naomi Aaronson, MA, OTR/L, CHT; Also published on Advance Healthcare Network. Naomi Aaronson, MA, OTR/L, CHT can be reached at www.recovercisesforwellness.com. Over the years, Pathology Perspectives has addressed many complicated conditions ranging from methicillin-resistant Staphylococcus aureus infections to polycystic ovary disease. For this issue, however, we are going back to basics and reviewing a condition that almost all of us will experience, if we live long enough: arthritis. Close to 800,000 people in the United States will have a joint replaced this year. Osteoarthritis is the main—but not the only—reason. Joint replacements have become so common that most massage therapists can expect to see clients who are in various stages of recovery from this procedure. But just because it’s common doesn’t mean it’s risk-free, and a person who has had a joint repaired has a significant chance of complications that impact bodywork choices in both the near and long-term. Following the odyssey of former President Bill Clinton and two more every-day Americans, Dr. Gupta introduces us to the work of Dr. Arthur Agatston whose method of screening for coronary calcium is considered one of the best predictors of heart disease. We’re also exposed to the work of Dr. Dean Ornish and Dr. Caldwell B. Esselstyn whose diet and lifestyle-based programs have shown recognized medical effectiveness at preventing and even reversing heart disease. “Heart disease could be as rare as Malaria in our country if we put into practice what we already know,” says Ornish. Gupta asks “Could we see the last heart attack in America?” The program brings us excellent information about what we need to do, but hangs on the gigantic “if” in the middle of Ornish’s statement. What we know is that medical check ups using the best testing methods available must be combined with successful lifestyle improvement. We know the formula. “Although people with a family history of heart disease are at higher risk, you can take steps to dramatically reduce your risk. 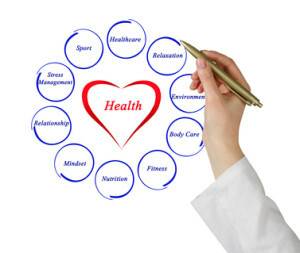 Create an action plan to keep your heart healthy by tackling these to-dos: get active; control cholesterol; eat better; manage blood pressure; maintain a healthy weight; control blood sugar; and stop smoking.” —The American Heart Association. What they are recommending, is all about behavioral change. The work of Dean Ornish has been widely accepted as medically legitimate for years, yet always qualified by mentioning that the probability of Americans adopting the lifestyle recommended is remote. Becoming a complete vegetarian, exercising regularly, practicing stress management skills and increasing social and emotional support is a tall order to say the least. Yet it works!Gupta’s report is telling us that change is possible, now we have to discover how. 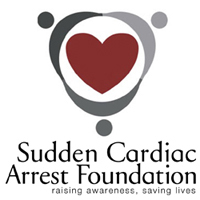 Here are some suggestions for the behavioral side of preventing that potential heart attack. 1. Know about your current state of health, in detail. Don’t put off that check-up or blood-work, make a commitment to yourself to get it done. 2. Envision what you want your health to be like. 3. Ask yourself, “What has to change in my life for me to live that vision?” This creates a solid foundation for you to create the plan that you will follow to make your vision a reality. 4. Develop a wellness plan that has a series of small steps. Small steps overtime lead to large lifestyle changes. 5. Gather support for your plan. Share your vision and plan with the people you know who will be positive and encouraging. 6. Track your behavior. Avoid self-deception by writing down or entering on a phone app your progress. 7. Acknowledge and celebrate every success along the way to a better life. Wellness and health coaches need to know about this information as they help their clients explore their way forward towards a wellness way of living. Coaches need to insist that any client they are working with on health issues be under active medical care. Lifestyle improvement is no substitute for medical treatment. Taking on the more behaviorally demanding protocols of lifestyle improvement that Ornish and Esselstyn require may be incredibly easier and more effective with an active alliance with a wellness coach. We know that people can be successful at improving their health if they can be successful at lifestyle change. Wellness coaching may be the bridge to span the huge gap created by the word “if”. Reprinted with permission from the Real Balance Wellness Blog. Michael Arloski, Ph.D., PCC is a licensed psychologist, Professional Certified Coach (ICF) and a Certified Wellness Practitioner. His work as a professional coach with Real Balance Global Wellness Services includes coaching people to achieve more of their potential in three areas: wellness coaching; leadership coaching; and mentor coaching of aspiring coaches. There is an opportunity for wellness and wellness coaching to impact the lives of millions of people in a life-saving way. 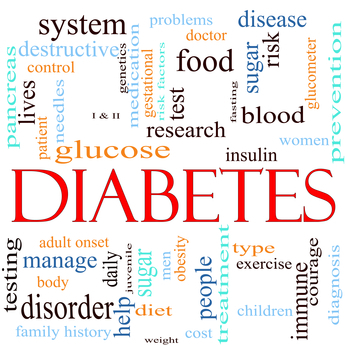 79 million Americans are estimated to have a condition called pre-diabetes. Usually symptom free, without intervention they will develop full-fledged Type II diabetes within ten years and possibly endure physical damage to their heart and circulatory system along the way. Yet, according to the American Diabetes Association, if a person is successful at lifestyle improvement they can completely avoid the onset of diabetes 70% of the time.